Malcolm Bass, Helen Rennard and Simon Yearsley had an excellent day on Ben Nevis on Saturday January 4, when they made the first winter ascent of Turkish (VII,7) on Number Five Gully Buttress. 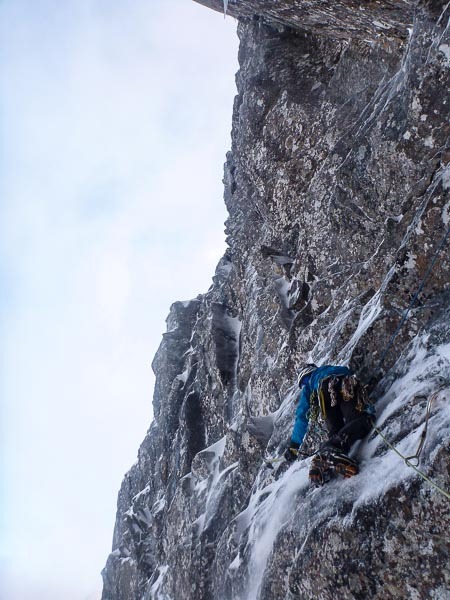 “Since climbing Free Range with Jim Higgins back in 2011, Simon and I have been waiting for an opportunity to get back on Number Five Gully Buttress,” Malcolm explained. “We’re not really drawn to winter ascents of classic summer rock routes, but the HVS Turkish, described in the Ben guide as ‘a poor route’, was first climbed in 1967, and hasn’t experienced a noticeable surge of popularity since then. So it was deemed a legitimate target. This area of the buttress faces south-east, and needs cold damp south-easterlies, or at least southerlies, to come into winter condition. Through last week the seemingly endless gales swung south-easterly for a few days and hopes were raised. But would there be enough of a gap in the storms to allow for an attempt? On Saturday there was, but it was forecast to be warm the preceding night before dropping colder during the day, and the cliffs were well defended by wet, fresh, slabby snow on the approaches. So, with Helen Rennard, we decided on a late start to let things cool and settle down, and packed spare head torch batteries. The bowl underneath the buttress can be nasty, so we’d planned to get in by abseiling down to the foot it from high on Ledge Route. But luckily, Number Five had already avalanched, very impressively, so we were able to climb the debris and then skirt round just under the crag. The climbing on the route was very varied. Steep corners with exits on good ice. Consolidated snow allowing progress up compact slabs. And a delicate technical crux. We are fairly confident that we followed the summer line, but a 1967 summer route description defined by ‘loose blocks’ on pitch three isn’t the best guide to a snowy 2014 ascent. At the base of the big corner we weren’t sure where to ‘trend across the left wall’. On my first attempt I went too far up the corner and experienced a rapid downwards trend. Party conference was in favour of a more defined steer to the left, and that took us across delicate sloping slabs to the crux steps under a bulging wall, which yielded (eventually) to crimps, undercuts, and thin hooks to gain a steep corner full of stacked flakes, well bonded by ice. We think this was where the tension traverse was used to avoid loose blocks on the summer first ascent. The darkness took us on this pitch, but there was virtually no wind. This entry was posted in New Routes and tagged Ben Nevis, Helen Rennard, Malcolm Bass, Simon Yearsley. Bookmark the permalink.